This motion was the second such recommendation to Mayor Pike. Last year on 17 March, MNAC sent a similar message to the Mayor, to wit: that “a rental housing licensing and inspection ordinance be drawn up for review and discussion in 2010 in a public process." This recommendation was also approved by an overwhelming vote but was manifestly ignored by Mayor Pike. In fact, last year Mayor Pike and then Planning Director, Tim Stewart, actively sought to derail action on rental licensing and inspection by the City Council. Click here and here to read about the Mayor's tactics. 85% of the neighborhoods voting on the 16th, supported licensing and inspection with a statement even stronger than the one they sent Mayor Pike last year. Not an insignificant percentage. Perhaps this time this recommendation will not fall on deaf ears in the Office of the Mayor. Over a decade ago, Pasco, WA decided to license and inspect its 6,000 rental units. One inspector, doing 8-10 inspections per day, completed the first inspection cycle in two years. 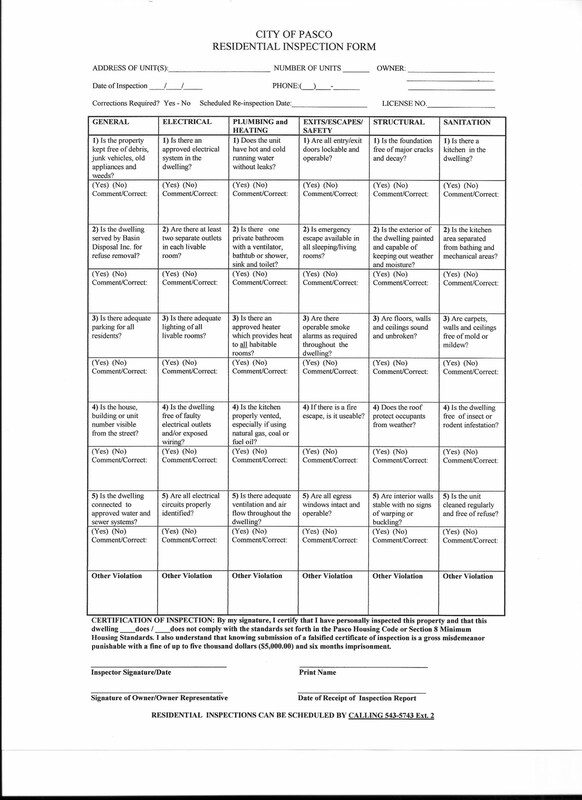 He used the checklist pictured at left (click on the image to enlarge it). Not all units were inspected. Those rentals that fell under other inspection regimes, such as with HUD (Housing and Urban Development) or with state certified inspectors, were taken off the list. Only a sample percentage of apartment complex rental units were inspected. This also reduced the number of city inspections. So the horror stories from the landlords regarding the cost of a program to the city appear unfounded. In my recent exchange with the governmental affairs director of the Whatcom County Association of Realtors®, he claimed that, in talks with city officials here, they projected the program would need 5 or more inspectors and that they would only be able to perform several inspections per day - each. This is not born out by the Pasco experience. That is why I have continued to implore the city council to bring Mr. Mitch Nickolds, Pasco's code enforcement officer, to Bellingham to present the facts about initiating a licensing and inspection program for rentals. Instead our city executive opposes licensing and inspections and creates a poster child in the form of Auburn, WA; a city that licensed rentals but never instituted an inspection program. In a recent conversation with Mitch Nickolds, I mentioned to him the contention by our mayor that Pasco is not a good example of licensing and inspection since there is such a large migrant worker population in Pasco vs. Bellingham. (My answer to the mayor here has been that we have our own migrant population in the form of students, more than 8,000 of whom pass through here on a yearly basis seeking housing.) Mr. Nickolds said that although they found substantial life threatening problems in the migrant worker rental housing, they also were surprised by the very serious problems found within the units occupied by the elderly. One can conclude that the migratory nature of the rental population is not the sole determinant of poor rental conditions as our mayor would have us accept. Indeed, more stable groups, such as the elderly, lend themselves to exploitation and poor housing conditions. One can add to this mixture the fact that during the second round of inspections two years later, Pasco found serious deterioration in many previously inspected units. This, after only two years. The Bellingham Fire Marshal has issued his reports on the fires at 1404 Grant St and 1418 Ellis St. earlier this January. The Grant St. fire displaced its 4 renters, three of whom present would have perished had not one of them decided to get out of bed to eat. The fire on Ellis St. was contained to one unit in a home that had reportedly been renovated into several apartments. You can read about these events by clicking here, here and here. The fire marshal investigates in order to rule out arson. He will provide information on the cause of the blaze but does not rule on who is at fault. This is done by an investigator so that fault may be assessed for insurance purposes. Unfortunately, these results may not be made public in the near future or ever for that matter. 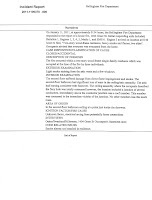 Images of the appropriate portions of the report of the fire marshal on these two fires are on the left (click on them to enlarge). The Grant St. fire originated in an electrical junction box located in the attic above a bathroom . The cause was likely "arcing from loose connections" The report also indicated that "Smoke alarms were not installed in residence." (Further contact with the fire marshal revealed that this sentence means that there were no functioning smoke alarms in the home.) Two of the residents personally told the Zonemaven that they had reported this to the management company before the holidays. They had also indicated that the electrical system was also giving them trouble in the form of flickering lights and tripped circuit breakers. As for the fire on Ellis St. it appears that the cause was a fan attached to a gas heater that had tripped a circuit breaker repeatedly the day before. The fan was held in place by bolts that were undersized allowing the fan to fall off the heater onto the rug where the fire started. The investigation also revealed that the house was rewired years ago, however, the installation was not inspected for compliance with codes. Earlier news reports indicated the smoke detector did not work. Landlords will complain that they install smoke detectors that are then sabotaged by the tenants or not maintained by the tenants who neglect to replace the batteries. I might remind the landlords that the smoke alarms are the last line of defense and that it is the underlying condition of the home that is the basic question. Working smoke alarms do not make a rental safer, they merely protect the renter from possible harm if there is a fire. But smoke alarms do not help with issues of mold, plumbing, vermin, structural deficiencies, etc. With these issues the first indicator of a problem is often disease or injury. During the Zonemaven's appearance on The Joe Show (click here to refresh your memory on that event), Mr. Perry Eskridge, Government Affairs Director of the Whatcom County Association of Realtors®, phoned with some comments on the Grant St. fire. 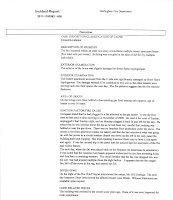 He spoke to having had contact with the owner of the property who informed him that the home had been renovated in 1982 with monies from a block grant and that it conformed to code as of that date. 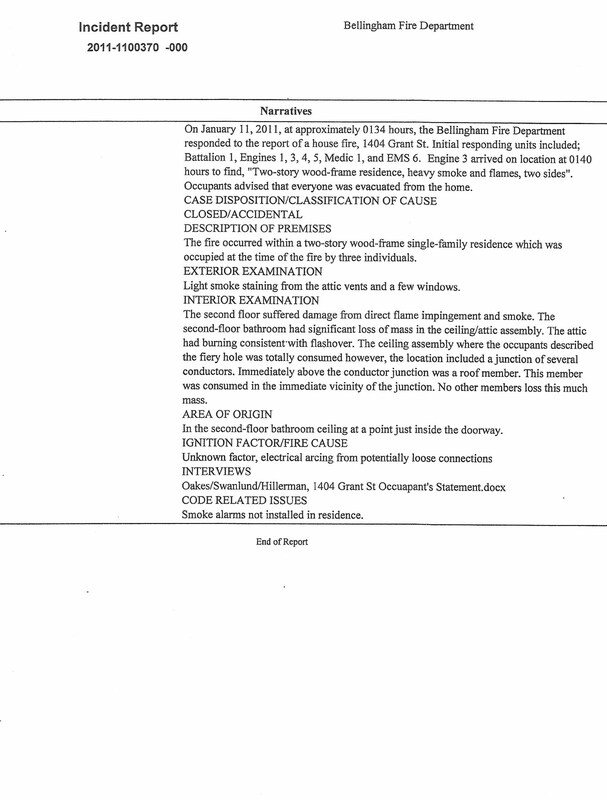 The home had also been inspected by Housing and Urban Development (HUD). 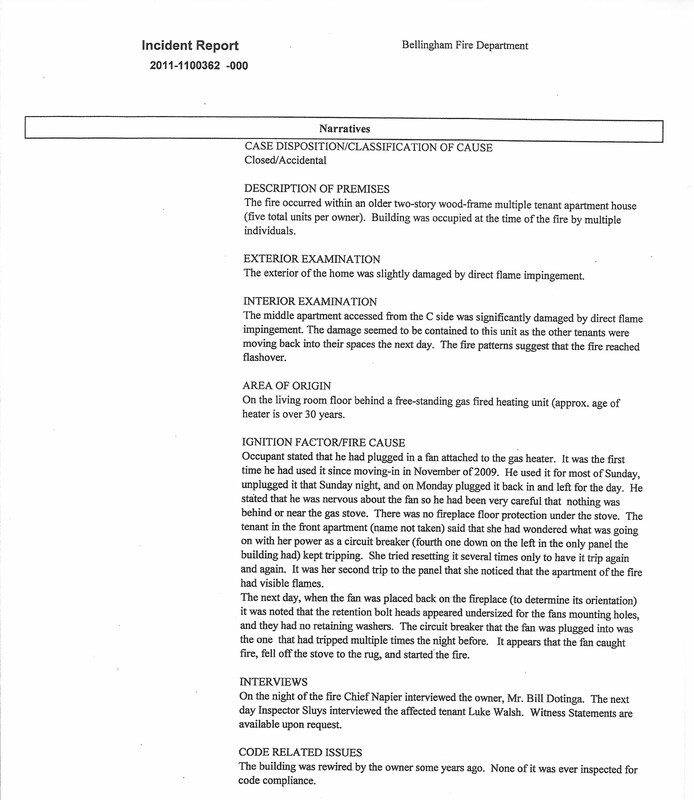 He further stated that 7 smoke alarms had been installed in the property in 2007 and that the tenant had the contractual responsibility to replace the batteries. Mr. Eskridge said also that there were three space heaters plugged into one outlet. It seems to me that a house that was up to code in 1982 might need a bit of work by 2011 or, at least, a periodic inspection. In Bellingham, though, that is not necessary. As for the smoke alarm installation of 2007, I wonder the reason for which the management company did not take action on its own during that period. Does the company not make periodic visits to ensure the health and safety of the tenants as well as the condition of the building? (The Washington State landlord tenant law allows the landlord to enter the home with a 48hr notice.) Had no members of the management team entered the premises for four years? Was there turnover of the tenants during that period? As for the space heaters, one might ask the reason for which the tenants felt a need to install such devices. One usually does not use space heaters unless the central heating system is inadequate. As mentioned above, because the fire is now under investigation by inspectors to determine fault for insurance purposes, we may never know the entire story. These matters tend to remain private, unless perhaps one of the former tenants takes the owner to court. Or, we can avoid most of these incidents by having a licensing and inspection program in Bellingham that will protect BOTH the tenant and the landlord. A recent story in the Bellingham Herald indicated a low rental vacancy rate in this area and suggested that, consequently, rental rates may rise as much as $50 per month. You can click here to read the story. The shortage overall does not mean that vacancy rates in the county are equally low. Vacancies tend to be lesser in number in areas of high demand, such as close to Western Washington University (WWU) where we know who will bear the burden of higher rents - the students. So the prediction is that rents will rise in these areas not because of rising costs but because there is less competition. Hiking rates in the absence of competition is call greed. Not surprisingly, I have not heard a flood of protest from the landlords or their associations about rental rate increases in this instance. We did hear from the landlords at the time they learned that they might have to pay the staggering sum of $3 per month, if a licensing and inspection program were to be created in Bellingham. They cried faux crocodile tears in loco parentis for the poor tenants who would have to bear the burden of the pass through of a potential $3/month fee even though there would be no obligation to pass the fee in the first place. I have posited before in this blog that the landlords have needed no excuse in the past 30-40 years to increase rental rates in this city at the times it suited them. (Complicit in this was WWU and the city. WWU because it built no housing on campus for decades and the city because it allowed the huge influx of essentially migrant tenants without taking any steps to protect the neighborhoods or control the rental housing stock.) To wit: the $525 per month for the filthy dump described in my blog entry of 18 January (click here to read that) and the $1330 per month for the hovel on Grant St. that burned out the student renters last month (click here and here to refresh your memory on that event). So I call upon the landlords to be true to their concern about rising rental rates due to licensing fees and to suppress the urge to raise rents for the simple reason that they can.